Having teenagers is fun. For many really deep reasons such as seeing them form their own opinions and own their faith and make their own discoveries. And for some not so deep reasons. Like all the fun that can be had by driving your teenagers crazy. Such as when you and your husband burst into song. Something from the 80's. Corny and outdated. And it evokes a face palm. Or, the threat of embarrassing them in front of their friends. Such as going on and on about all your hip hop moves and hip hop fashion you intend to break out for that Lecrae concert that you are attending with them. And one of my personal favorites--using current slang incorrectly. Saying, "LOL," as in a word, rather than the initials when they say something funny. Or telling them that they are the bomb dot com. 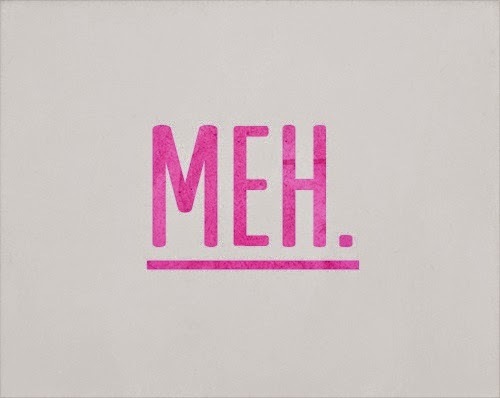 But one slang word that I actually think is quite descriptive is the phrase, "meh," as in, I'm not feeling it. Just sorta so-so. Not so much. Rather blah. This is sorta where I've been lately. IF you are one of my faithful readers, then I love you both for it! And I'm sorry that I have been absent as of late with posting my wisdom and insight and world changing musings. I've been feeling sorta meh. Tired. Worn. Frayed. Run down. Sorta lost my words. Not really even speaking in complete or very coherent sentences lately. Pressing on to the Mayhem that is May. As Jen Hatmaker so eloquently blogged, I've been rather busy being the worst end of school mom ever. After the amazing experience of ending April with my big Swap and Shop charity event, I came down in a flame of glory. I got nothing. Nothing more to give to the endless tasks of field days and success ceremonies and that new online registration process at the high school. Teacher appreciation (I love you teachers! I just can't seem to express it!) and track banquet and piano recitals and why did I sign up for that 5K? This year has been one of the most thought provoking, faith refocusing and exhilarating times in my walk with Christ. Last year was just plain deconstruction--learning to cast off religion and rules and tradition and embrace the God of grace and love who wants me to thrive as I root myself firmly at the feet of Jesus. Mind blown. Mind still being blown. And, now it feels a little like about 6 weeks after youth camp. The high and fervor and excitement has melted into the mundane tasks and duties of life and etching out that place of growth and joy seems harder to do. Ever feel like that? Just MEH? Whether you admit it or not, I know I'm not alone. I know that even the most faithful followers of Christ or moms or employees or students hit a wall. And they wilt. Motivation and stamina melting into meh. Okay. That's all I got today. Thanks for reading. Listen, bloggy friends, here I am in my MEH and I've been wracking my brain for some pearls of wisdom to impart. Instead I just present myself to you. As is. Keeping it real. So you know you are not alone in your meh-ness. In your reverting to old habits or just plain "stress paralysis" (my new favorite phrase coined by the movie Moms Night Out...more on that tomorrow). I sorta half-heartedly prayed about this while running about a week ago. Which basically meant I sorta thought, "God, I'm just not feeling it. Feet in concrete here. I was rocking and rolling. Not sure what hit me. I think it's called the month of May. Can you help me out here?" Then, I waited for it. The burst of energy and renewed enthusiasm to run my race of faith well! Taking big strides! Moving forward! Tackling the world! Being AWESOME! Instead, I got a sick kid who ran fever for seven days straight. Starting in the week that the fourth graders from school go away for their much anticipated two nights at Adventure Camp. I felt some old familiar enemies creeping in. Fear. Anxiety. Knot in the stomach. Frenzy. Can I get her well? What's the right thing to do? Major. Self. Doubt. So I consoled myself like any reasonable mother in the social media age. I spent my long hours rewetting washclothes, checking temperatures, praying for a miracle, hoping against hope...and obsessively checking Facebook. Instagram. Pinterest. Seeking affirmation and validation and connection apparently. Plowing through my daily Bible reading like a task needing to be accomplished. We made it! Fever free! Off to camp. For 4 hours. Until the fever hit AGAIN with a vengeance. Topping out at 103. I cried. She cried. We left. The end of the world for a 4th grade girl. And her crazy, frenzied, MEH mom. Back at the sitting around. And then, I felt the quiet nudge. In the endless BLAH that is a sick kid who is BORED and you are quarantined. And you wear the same pajamas four days in a row. Hypothetically speaking. And the whisper. "I'm right here. Just rest. Rest a while. It's okay. Unload the burdens. Lay them down. I am your affirmation. I am your connection. I am your validation. My grace is big enough. Swim deep. In fact, float in it today. Just be meh. And float in the grace and love that I offer, deep enough to handle your MEH." Be. Not do. Not a task. Not a to-do list. Not a frenzied search for answers. Just be. Just as my sick child needed me to just be with her because I could not make her sickness go away, my Heavenly Father said quit trying to make my MEH go away and just be with Him. Bring it to Him. Quit hiding it or pretending it away. Be the child of the King who sits around in dirty pajamas and snuggles with my girl because that is what He wanted me to do. Just let Him hold me close. Until the meh has run its course, like my daughter's viral infection. Recognize that seasons of growth and energy and great gain can melt into seasons of lull. And I can get frenzied looking at the big picture of the tasks and duties and calendar flying at me, comparing myself to those around me who are so NOT MEH. Or, I can run to my Daddy's arms and just rest at His feet. And let it be what it is. A time of regrouping. Yes, there's work to be done. There's purposes and specific callings to fulfill. But sometimes, we just need to rest. All worn out and tired and allow ourselves to spend ourselves to the point of meh where He can hold us close to whisper the next tiny step. And the only call to action. To follow Him. We need to let the Living Water fill our empty souls again. In those moments of meh. So that we are ready to pour ourselves out again. Because it's hard work. In this world, we will have tribulations. Big hairy scary ones. Like illness and financial crisis. And tiny irritating ENDLESS ones like a pile of school papers to read and a broken appliance and a list of calls you forgot to return and a bad hair day. So run to the arms of the Father and His loving embrace. To carry you through your MEH. He's got this. He can handle it and carry you through it! And He loves just as you are. Tired. Worn. Frazzled. Hopeless. So keep it real and let Him know. No pretenses. Onward and upward! To the other side of meh.